I like Windows 8, but only because its desktop mode is basically Windows 7 with faster boot times. The thought of using the "tablet" mode, or even swapping between the two, fills me with dread. Unless, that is, future versions of the operating system look like Jay Machalani's design. The "self-taught user-experience designer" has shared a detailed and far-ranging redesign of Microsoft's OS with The Verge, and I love what I'm seeing. The short version is that he's found a way to bring both of Windows 8's modes - the separation of which is clumsy at best - and brings them together, making for a more seamless and intuitive experience. 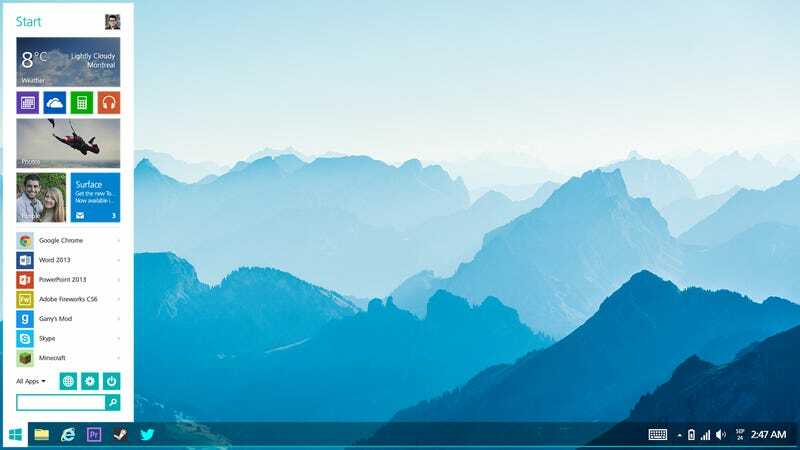 The "Start" menu returns, and serves as a hybrid dashboard of sorts, combining the functionality of a traditional Windows menu with Windows 8's Metro "tiles". Perhaps the most useful idea, though, is one I'd have loved to see in Windows 8 from the start; the ability for Windows 8 tiles to be snapped in desktop mode. Of course, he's just a self-taught kid, not a Microsoft executive or programmer, and while his design is certainly technical in parts and very involved from a UI perspective, he's hardly going to know if Windows code can actually (and reliably) support a design like this. But maybe the elegance of his design, irrespective of a background in engineering or coding, is the point, revealing everything people have so far failed to warm to in Windows 8. With Windows 8, Microsoft tried to completely redesign Windows, but the "Metro" side lacks functionality while the desktop side is too tethered to the past. The company's solution was to awkwardly partition the two. Machalani's design is showing that maybe things would have been better if the two hadn't been kept so apart. If you're a design or UI junkie, you really should go read the whole thing. If you're thinking it's just a guy using Photoshop to make Windows look prettier, it's a lot more thought through than that.